The rollover cradle doubles as the boats supports and cradle when upright, and it has to be strong enough to enable the hull to be rolled onto its side, then slid sideways to give enough space for the next half rotation. You can see that we have a lot of gear to move in the morning so we can roll the boat. I wasn’t going to do this with the rollover scheduled for tomorrow, but what we did today has been interesting enough to justify a diary entry of its own. 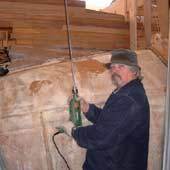 First of all, while drilling another job requiring long holes we found that the conventional leadscrew footed auger used for drilling big holes in wood did not run very true and was prone to wander off the line a bit. In fact it wandered a LOT when used in hardwood. 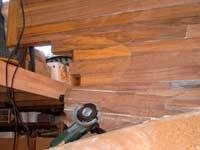 In traditional boatbuilding a “barefoot “ auger with no leadscrew and specially shaped spurs (cutters) was used, but they are so rare as to be almost museum pieces and the conventional ones are too different to modify. All this lead me to be hoofing off down the road to Ross Todd Engineering in Cambridge where Paul the fitter and turner welded two 10mm engineering twist drills to metre long pieces of 3/8in mild steel bar, set them in the lathe and straightened the join with a hammer, then turned the weld off flush. Nice job, done at very short notice, and the cost was very moderate. Thanks Guys. 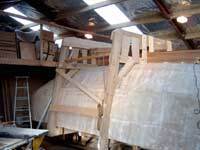 When we got these home, our first job was to put holes through the keel so we could put three temporary bolts through , we used frames 3 and 7, one through frame 4 and two in frame 7 which is the heavy one at the forward end of the engine bay. A long drill bit, the longest hole required is about 850mm, this extended bit is just under a metre long. So far it seems to run very true. Starting the drill in one of the holes, you can see the plumb bob in the background and how hard Charlie is concentrating. The drill is to push the drill in about 20mm, pull it out and clear the waste and then in for another 20mm. Takes only a few minutes, perhaps 5 or so to drill 600mm and it tracks perfectly. 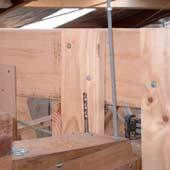 One of the temporary bolts in place, just 9mm mild steel threaded rod to temporarily secure the keel while the boats being moved around. You can see the drill has just broken through the surface to complete the second hole of this pair. These bolts are to make sure that the keel is secure when the boats rolled tomorrow. Now the holes are long, the two aft ones about 600 mm long, and they need to come out within a few mm of the target at the other end. Not easy? Note that the target is critical sideways, but not so much fore and aft as the ballast keel bolts are separate systems. What we did is we got Charlies very fancy plum bob, got inside and suspended it from the frame 8 cross floor at the same distance from the centreline and put the metre long drill into frame 7 with the big Hitachi drill on low speed. 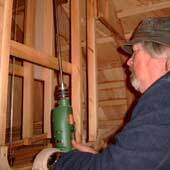 Lining the long length of the drill up with the string on the plumb bob and watching to keep it there, the holes came out well within tolerance. Whew, another scary job turns out not to be too much of a problem. This morning, I got the Arbourtech power wood carving disc out and put it on the Bosch 115mm angle grinder, and after rough shaping the after end of the keel deadwood and tailpost with the power plane, and marking out the scalloped area around the propellor aperture started carving away. The Arbourtech , mounted in my Bosch angle grinder is doing a fair job of carving the complex shape around the prop shaft tube. I need some more practice but its going to do the job. 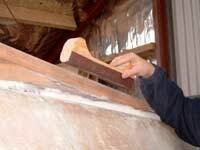 To shape the fillet that fairs the keel to the bottom is a slow job, so I got Charlie to make up this little shaped sanding block, its got 40 grit commercial sandpaper contact glued to what is just an offcut piece of two by four, and handles cut with the bandsaw. Useful tool! Interesting tool, I’d only used one a very little and that a long time ago. It was quite different to this latest model one which is supposed to have no kickback, and which has little tungsten carbide cutters which I expected to make short work of the hardest of wood. It works fine, no real kickback but a lot of torque reaction. It will work better with practice, and while a bit scary is no worse than a lot of other tools. I found that either dragging the angle grinders guard along the work and angling it so that the trailing edge of the cutter just contacted the work kept the torque and material removal controllable, and when smoothing the work a very light brushing action makes a good job. It’s a tool that should be used with caution for sure, but its doing a job that I’d hate to have to do any other way, and I’m pleased with it so far. Warning, I am using the “Arbourtech industrial wood carver” without the guard that comes with it, relying on the guard on the angle grinder because I want to use the face rather than the edge of the tool and the standard guard does not allow face cutting. But be aware that the manufacturers strongly recommend using the guard.